For a moment this summer, I had the pleasure and pain of peering through a tiny window into a piece of the life my daughter lives sometimes. I devoured it in a plane ride and a late night wrap-up with twins and a five year old in tow, so anyone can do it. Since, it’s served as a family conversation piece; communicating to EVERYONE in our tiny nuclear from age 2 to 39. I get that it’s got a Newberry, so I’m late and it’s a graphic novel memoir, so it’s what everyone’s already been blown away by, but just watching my two year olds and my husband read the same book together, hearing my five year old ask about the symbolism of the protagonist’s imagined identity in the superhero cape, and getting my own insight into some of the awkward insecurities and pure rage my eight year old lives with when she can’t hear us reminds me why I need to read more for pleasure. This Fall I discovered (as I completed a reading survey alongside my students) that I didn’t spend enough time reading for my own pleasure. While there are certainly elements of my professional reading that give me a little of that jouissance, I mean the kind of self-directed choice making that has no pressure. no requirements. no helicopters. no expectations. And that is precisely why I was so blown away. I did not know what to expect. And there it was, like a rainbow unfolding in our family and beyond. I left a library copy by accident with my friend James who accidentally gifted it to a bereaved family member. We didn’t ask for it back and he didn’t want to return it. 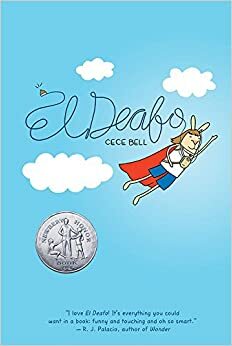 Then it appeared in the summer reading rewards bookshelf at the library and Sadie (with a little of my motherly urging), picked it up and brought it home for everyone to fall into as I already had. Thank you, Ce Ce Bell. Thank you to all authors who put themselves and their lives into composition. Thank you to all the artists who push boundaries that are, in my opinion, slowly eroding when it comes to what counts as literature and what counts as scholarship. Your work is a gift. Looking at the colorful things in life. A chick who loves to read books, write stories, and play video games. Oh, and reflect on the happenings of life.